It’s upon us! The summer that we’ve all been waiting for has arrived with a vengeance. 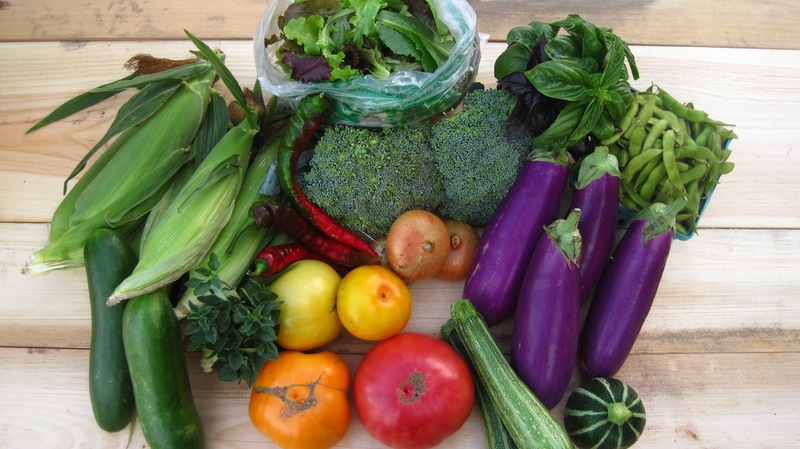 The vegetables that have been producing in fits and starts, like the corn, eggplant, peppers and tomatoes have all started going like gangbusters. Yesterday we harvested some 350 POUNDS of tomatoes from the field, so you’ll be seeing lots of those beauties in the boxes this week. Heirloom tomatoes are in full swing, and there are lots of things that make them special and require some special attention. 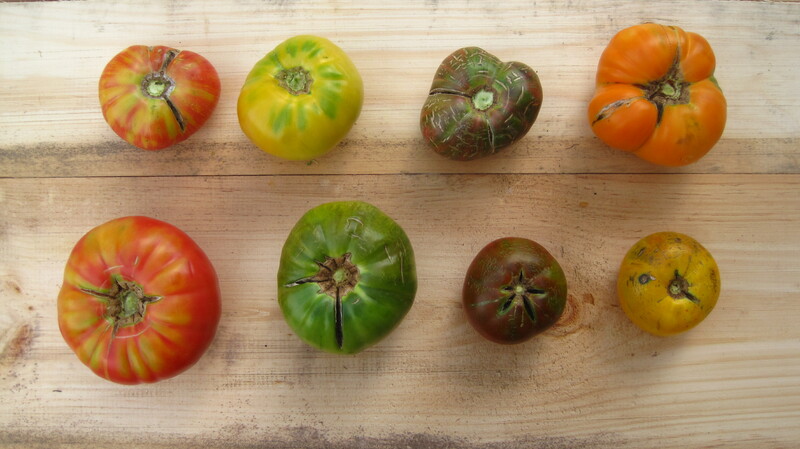 Heirlooms have not been bred to pick two weeks in advance of purchase and to be ripened in warehouses with ethlylene gas, like their large scale industry cousins. Heirlooms are designed to be eaten right away. We spend a LOT of time harvesting tomatoes at Sleepy Root, deciding for each variety how they will be in the 2-3 days after we pick them and you receive them in your box and eat them. 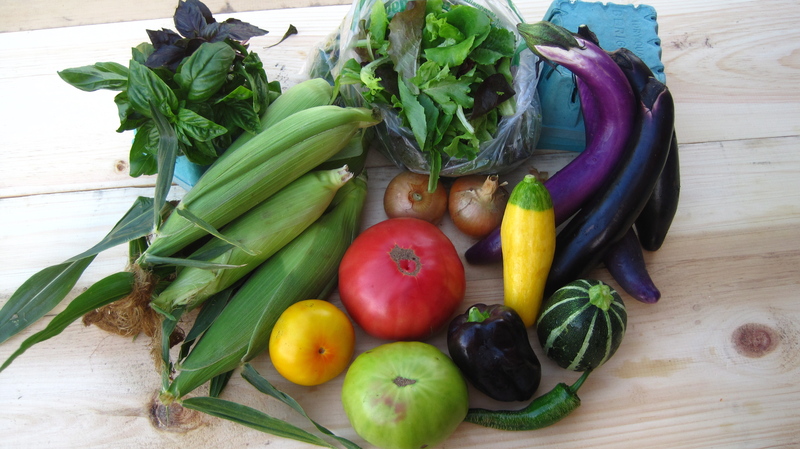 Each variety is a little different, and the white and green varieties require even more thought! They are not designed to ship well or far, so we pack them super-carefully in the boxes to protect them on the way to you. Once you get your box home, take the tomatoes out right away. Store them on your counter top or a table, stem sides down. The shoulders of the heirlooms are all stronger than their plump little bottoms, so store them on their shoulders until you use them. The sheer weight of these dense, large tomatoes is enough to bruise themselves if they are stacked on top of each other or stored on their bottoms. Never, ever store a tomato in the fridge prior to eating them. The cold breaks membranes in the cell walls and creates a mealy, watery mess. Not tasty! Our friend, neighbor and member (yes, all one person!) loaned us a book on phytonutrients the other day, and it’s been a fascinating read. I’ve certainly learned a lot about tomatoes. The tomatoes that are darkest red have the most amounts of lycopene on average, and the smaller the tomato the higher the sugar content. Tomato salsa, a staple in our diet and one of the tools we use to get through these northern winters, is an incredible super-food: full of lycopene from the tomatoes, and cilantro, which has more antioxidant qualities than spinach! We like to recommend that you eat your tomato with skin and seeds-this is where the vast majority of the vitamin c, lycopene and total antioxidant value lies. In contrast to many other fruits and vegetables, the more you cook tomatoes the more health benefits you get. Cooking tomatoes make their lycopene more bioavailable to us. For more information on food and health, please check out this book. It’s got a wealth of information on nutrition and food, so much so that we forgive the author for advising that you store the tomatoes on their bottoms! 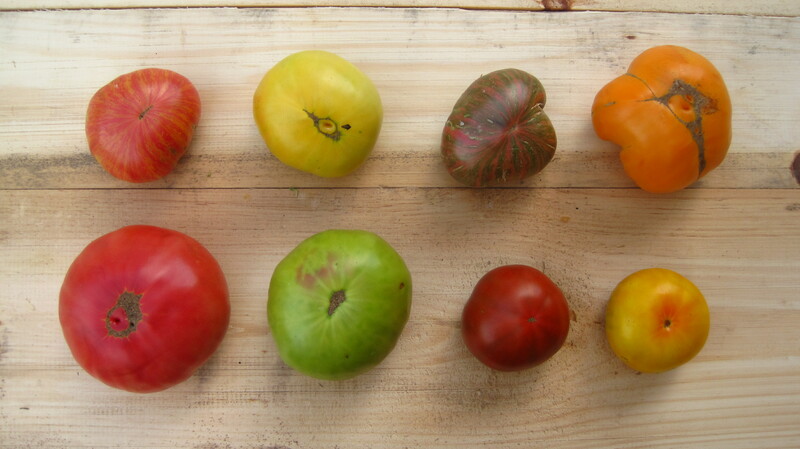 Below you’ll find a charming set of photos showing you what your tomatoes will look like (by category) when ripe. Clockwise, from top left: striped, white, striped again, orange, yellow, black, green, and red. An heirloom line-up, clockwise from top left: Chocolate Stripes, Great White, Chocolate Stripes (wild variations in this one! ), Dr. Wychee’s Yellow, Azoychka, Amazon, Emerald Evergreen and Cherokee Chocolate. Sweet Corn-We’ve moved on to another patch, which is much sweeter. A “super-sweet” variety, actually. Some of us love the extra sugar, some of us crave a more “corn” taste. What do you think of the two varieties we’ve had so far? We never tire of corn around here. Be sure to try the fritters recipe below if you like that kind of thing-it was a meal highlight in our house, and paired with Brandon’s Basil Mayonnaise couldn’t be beat! Eggplant-There’s loads of eggplants out there in the fields! We’ll keep sending recipes for neat ways to use these heat-loving vegetables. Lettuce-The cool weather of the past few weeks has given us another really tasty crop of lettuce. Perfect food for this crazy hot weather! Hot Peppers-Everybody got a Hot Striated this week! Look at the skin of the pepper: if it has lots of little cracks and lines on it, watch out! That’s the hot pepper…eat with caution. 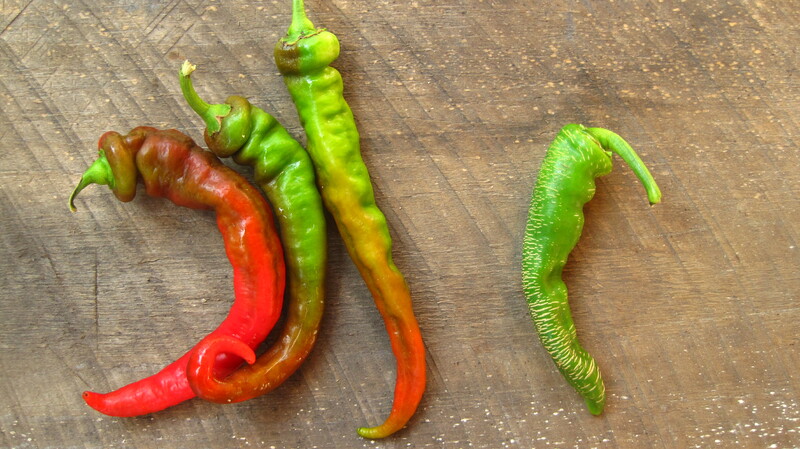 Our Minneapolis neighbor and member, Lise, suggested we post a photo guide of hot peppers. Lise, you’ve got it! Great idea. As soon as all of our hot peppers are ripe, we’ll take a group photo. For now, here’s how to tell the ones apart that are in this week’s box. Edamame-These tasty fresh soy beans are the snack star of the sushi bars. Lightly steam, toss with a splash of sesame oil and salt, and eat right from the dish, pulling the beans out with your teeth and discarding the pods. Yum! An awesome, quick mid-summer meal. Pair with basil mayo and a green salad with sliced tomatoes and you’ve got the perfect hot weather feast! In a medium sized bowl mix together sugar, baking powder, cornmeal, flour, salt and pepper. In a small bowl blend milk and egg together. Add the milk/egg mixture to the dry mixture, stir just until combined. Fold in the raw corn kernels. Pre-heat a cast-iron skillet or other heavy bottomed pan, add oil and once it begins to shimmer, gently drop in batter, about a half-cup at a time. Cook until crispy and browned, then carefully flip and cook the other side until crispy and browned. *Save the cobs and make into a corn stock. Perfect for the base of a bacon corn chowder or jalapeno cheddar corn chowder. Pre-heat your oven to 425 degrees. Keeping them separate, dice your vegetables and toss with olive oil, coating well. Add salt and fresh black pepper. Place each vegetable in their own dish or sheet tray to roast, as they will all finish at different times. In our house, it takes about 20-35 minutes to get each vegetable golden brown, crispy in places, and cooked through. We also stir the vegetables once or twice in the cooking process, and add a splash of oil if anything looks dry. The tomatoes will probably take another 15-20 minutes since you’ll want most of their moisture to evaporate through roasting. Remember the good news about tomato nutrition and cooking?! Once everything is cooked enough for your taste, remove from oven and cool. Once cool, slice as much basil as you like and stir it in. Ratatouille is great as a side dish, makes a lovely pizza topping, or a spread for crackers and bread.